In one of my earlier post on ‘site for fairly used cars for sale’, I shared with you an article on where to buy fairly used cars in Nigeria and their prices. That article contain a list of websites I considered to be top 10 places to buy new and fairly used cars in Nigeria. Among those sites is NAIRALAND AUTOS. 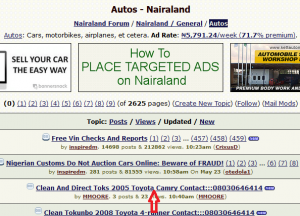 Nairaland autos is a section on Nairaland forum that offers users opportunity to buy or sell new and fairly used cars in Nigeria. The auto section is a good place to haunt for fairly used cars for sale by owners. 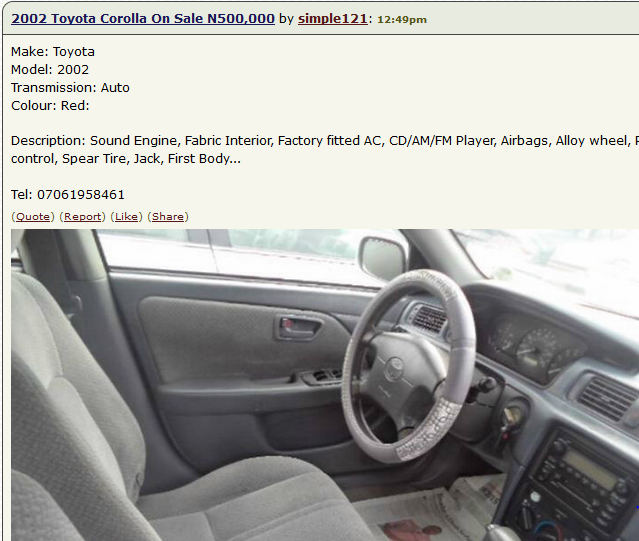 A visit to Nairaland auto section shows links to varieties of new and fairly used cars posted by their owners. To view any of the new posted cars, click on the car posted title link. Before you go into haunting for new or used cars for sale on Nairaland Autos, consider following these 10 steps to buy your right choice of new or fairly used car. Step #1.What do you need the car for? • Spare parts should be readily available. For a car taxi drop business purpose in Nigeria, you need cars like Toyota product (Toyota Camry, Toyota Corona) Mitsubishi car, Peugeot 504 Station Wagon car etc. • Air conditioned, and well homemade interior. Steps#2.How much do you wish to spend in buying the cars? Check the regular market price for second hand cars. If you don’t have enough money to buy the car, consider saving money for the car rather than borrowing. It is usually difficult to repay money borrowed to purchase a car. As a way of assessing the car on your own, you can check different reviews that have been written concerning the car or similar car you want to buy. A fairly used car with a second hand value is a good one. Reviews will show nature of fuel consumption of the car, the availability of spare parts, model and possibly durability. It is important to check the history of the car you want to buy. With the use of the vehicle identification number (VIN), you can check history reports of the car. History report will reveal if the vehicle have had major damage in the past, some notable changes made on the car in the past and some other past important information concerning the car. After your checks and review, then you can contact the seller probably through phone call. On the course of your discussion with him, ask him why he is selling the car, some of the major repairs that have be done on the car before and the ones you will do after you purchase the car. If you are convinced that you will buy the car, you have to schedule a day to meet the car seller one on one and the car you want to buy for an inspection. If you don’t have a good knowledge of the car; it is usually better to go with a car mechanic or someone who have a good knowledge of the car. Proper inspection should be done on the car as most cars that are sold as fairly used cars usually have one fault or the other. After inspection, drive the car and allow your car mechanic to drive it too. Many operational hidden fault of the car is usually detected at this stage. Listen to the sound of the engine and other noticeable sound. If the sound is not good for your liking; it is time you end the deal. If test drive the car and you are satisfied, you need to negotiate for the price with seller. Look! You have to be smart here. When bargaining for the car price, try to beat down the price to a reasonable extent. Do not be intimidated by the seller’s negotiation skill or by his persuasive marketing skill. You also need to be smart here too. Do not pay for the car by giving the money to seller in hand. Every payment should be made through the bank. You receipt for payment should be properly documented. As you are paying for the car, you are getting the vehicle particulars and license from seller simultaneously. Make sure that the particulars and car license are the original documents of the vehicle. You can confirm this before making payment to be on a safer side. The prices of fairly used cars in Nairaland autos vary according to the car seller. Those cars are used cars for sale by Owners, so there is no consistent price list for fairly used cars in Nairaland. This is why there is avenue for bargaining of the car price. Don’t take what you see as the price of the car on Nairaland autos to be the actual cost of the car. There are room for negotiation. A better way of search for nairaland cars through Google is to include the state in which you’re residing on. Example; nairaland cars for sale in lagos, nairaland used cars for sale in Abuja, , nairaland used cars for sale in Portharcourt, , nairaland used cars for sale in Ibadan etc. To sell fairly used cars on Nairand, visit the Nairaland Auto section. If you have not registered on forum before, register and post your car for sale. Include all necessary contact details. My husband and I are looking for a used car, but we are having a hard time finding one that we like. Your steps sound like a good way to make sure the car we end up buying is reliable and a good deal. I’ll be sure to check the history report when we find a car we want to buy. Buy clean tokunbo vehicles at a cheap and affordable prize,call 07067414341.